Peak Design's innovative approach to design and engineering earned them four corners for their camera strap system, which we reviewed last year. So we pestered them for the company's new 13-inch Everyday Messenger Bag to review. And it arrived in style the other day. Peak Design Mailer. A bag fit for a bag. We're used to seeing review products arrive in battered brown cardboard boxes, protected by a paper or plastic wrap. The boxes are usually ill-fitting, which just invites the use of more wrap. Invariably we have to wrestle these big boxes down to the bunker to do the unboxing. But Peak Design's packaging made us smile. They were shipping a bag, after all. It's supposed to be able to handle some rough treatment getting around town. 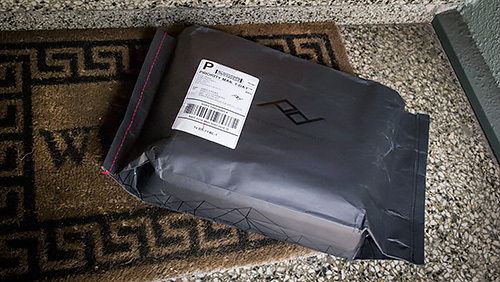 So what better than to ship their 13-inch Everyday Messenger Bag in, well, a paper bag. A nice black one with their logo discretely varnished on the flat black bag. And instead of the usual packing tape sealing box flaps, the Peak Design mailer was sewn shut on both ends. Of course it was. But the sewing was different on the two ends. 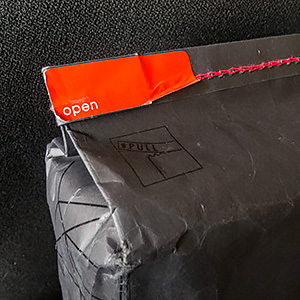 A bright red tag told you what to grab to open the end intended to be opened. And a subtle graphic near it showed you how to pull it. When we pulled it, the red threads were stripped from the bag and a black strip covering the opening fell away to provide full access. Inside, the 13-inch Everyday Messenger Bag rested undisturbed with no wrap of any kind. And ready for a test drive.